Something that I noticed when working as a pharmacist was why people would still gain weight even though they were following a strict low fat diet recommended to them by their doctor. This made me question whether it is really the ‘fat’ that causes us to gain unhealthy weight. After seeing so many people suffering from obesity related diseases like heart disease, diabetes and the side effects of the medication they were taking, I was strongly motivated to research what actually causes people to become obese, it clearly was not just the fat they were eating! Fructose is the form of high fructose corn syrup found in pretty much all processed foods such as ready meals, fast foods, sweets and fizzy drinks and most people are totally unaware of its danger. It is also often found in ‘low fat’ supposedly healthy alternatives and even many popular weight loss products because food with the fat taken out simply tastes horrible. High fructose corn syrup in combination with many other additives are usually added to enhance the flavor. Glucose is the type of sugar our body loves. It gets metabolized by every cell in our body and is very easy to burn with very few toxic by-products. It also tells the brain to stop eating when you are full. Fructose on the other hand is another type of sugar and is found in sucrose which breaks down to glucose and fructose. Fructose is actually only metabolized by the liver and it’s very similar to ethanol (the alcohol in drinks). When you consume it, it’s actually like ethanol but without the high. It confuses the liver and ends up making lots of bad fats in the process. It also doesn’t signal your brain that you are full. This is why people can drink massive cups of fizzy drinks which are high in fructose and still eat huge meals containing refined foods that are also full of fructose. Many fruits also contain fructose, but nature has provided the antidote, as these fruits are also packed with fibre which prevents your body from absorbing too much of it. When I advised people to reduce their consumption of high fructose corn syrup by eating lower carb/higher protein diets, free from processed foods, even if the labels say they are healthy options, they started to lose weight and feel much better as a result. In many cases I asked people to just stop their consumption of fizzy drinks like Coca Cola and instead swap it with either plain water, or add some freshly squeezed lemon for flavor. Green tea is also a great alternative, and it is one of my personal favorites because it contains alpha wave stimulating theanine that also double serves as an antidote to the harmful effects of caffeine. Those who loved to drink tea and coffee sweetened with lots of sugar, I advised to swap with natural sweeteners like stevia instead. This alone had some remarkable results. There are 1.6 billion servings of Coke sold each day worldwide!! A very significant percentage of that is through supermarket chains like WALMART. So you can imagine how unpopular I became in WALMART’s head office in the UK with my information strongly advising people to stop drinking fizzy drinks like Coke! 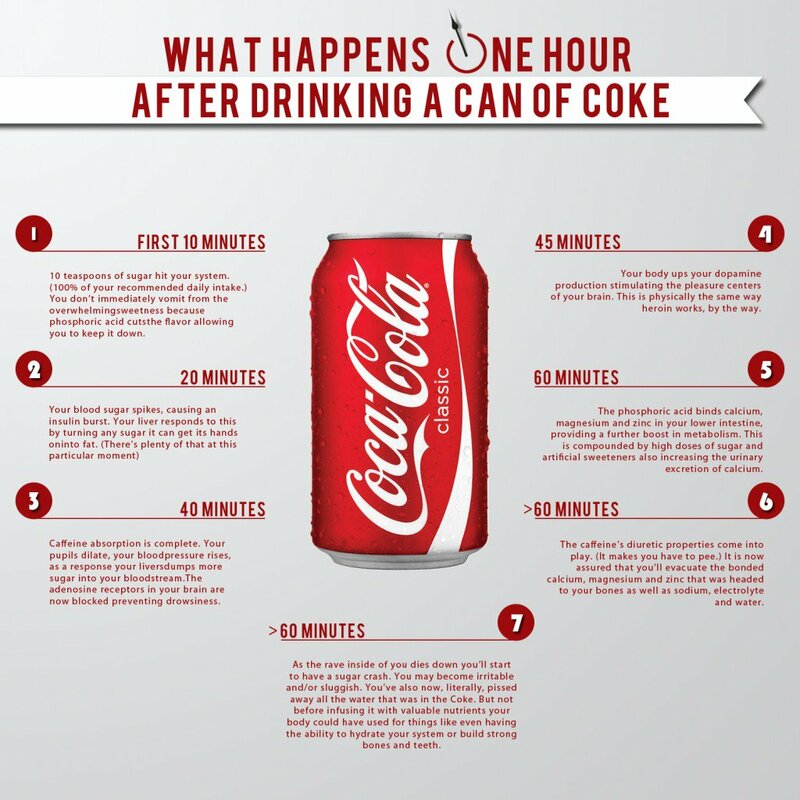 I recently came across a great article by Wade Meredith that explains what happens when you drink just 1 can of Coca Cola and this applies to pretty much most caffeinated soft drinks, not just Coke! I have added citations to research I have found that gives some evidence to the claims in the original article. 1. In The First 10 minutes: 10 teaspoons of sugar hit your system. (100% of your recommended daily intake.) You don’t immediately vomit from the overwhelming sweetness because phosphoric acid and other flavorings cuts the flavor allowing you to keep it down. (1)In animals, or at least in laboratory rats and mice, it’s clear that if the fructose hits the liver in sufficient quantity and with sufficient speed, the liver will convert much of it to fat. This induces a condition known as insulin resistance, which is now considered the fundamental problem in obesity, and the underlying defect in heart disease and in the type of diabetes, type 2, that is common to obese and overweight individuals. It might also be the underlying defect in many cancers. 3. 40 minutes: Caffeine absorption is complete. Your pupils dilate, your blood pressure rises, as a response your liver dumps more sugar into your bloodstream. The adenosine receptors in your brain are now blocked preventing drowsiness. (3) Caffeine had a strong anxiolytic and psychostimulant effect by activation of μ-opioid receptors. 6. >60 Minutes: The caffeine’s diuretic properties come into play. (It makes you have to pee.) It is now assured that you’ll evacuate the bonded calcium, magnesium and zinc that was headed to your bones as well as sodium, electrolyte and water. (6) Total urine output of water, calcium, magnesium, sodium, chloride, potassium and creatinine increased in the two hours following caffeine ingestion when compared to the control beverage. 7. >60 minutes: As the rave inside of you dies down you’ll start to have a sugar crash. You may become irritable and/or sluggish. You’ve also now, literally, pissed away all the water that was in the Coke. But not before infusing it with valuable nutrients your body could have used for things like even having the ability to hydrate your system or build strong bones and teeth. Coke is not just high in high fructose corn syrup, but it is also packed with refined salts and caffeine. Regular consumption of these ingredients in the high quantities you find in Coke and other processed foods and drinks, can lead to higher blood pressure, heart disease, diabetes and obesity. A study by Harvard university showed that drinking just one can of sugary fizzy drink a day raises the risk of heart disease by 20%. Sugary beverages also are believed to promote inflammation, an immune-system response involved in both heart disease and insulin resistance, a major risk factor for type 2 diabetes. Scientists investigated the connection between fizzy beverages and heart disease by analysing data of 43,000 men, taken from the Health Professionals Follow-Up Study. However a small amount now and then wont do any major harm. Even Sandy Douglas, president of Coca-Cola North America, admits that he limits himself to less than a can of Coke a day for health reasons. (8) We should all know by now the health risks associated with soda due to its highly acid forming recipe of sugar, carbonated water and additives like salt and phosphorous. But a recent Gallup poll reveals that 48 percent of surveyed Americans – nearly half! still drink soda on a daily basis. What’s more, among those who drank soda, the average daily intake was 2.6 glasses per day. Niraj Naik is an ex-community pharmacist turned ‘renegade’ after recovering from a chronic illness without medication, when conventional medicine had given up hope. He likes to share what has worked for him and the latest research in holistic healthcare over at his blog.